We strive to provide the highest quality service to our clients. Thermography can allow individuals an opportunity to actually see, through visual imagery, the efficacy of their body processes. When clients are able to finally visualize their bodies in this way, they become effective in monitoring and orchestrating their own path to optimum health. Thermography empowers clients to become proactive agents of self-change with a focus on disease prevention. 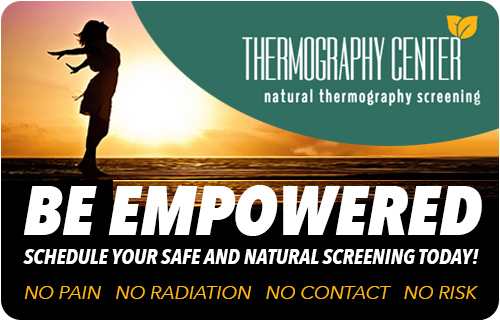 Thermography is a 100% safe, radiation and compression-free screening test for men and women. Natural breast screenings, full body thermal scans as well as other specific regions of interest or concern of the body are procedures available through The Thermography Center. Once the procedure is completed, it is vital to understand the report findings. Many screening tests and tools only provide patients with a "normal" or "abnormal" report. We strive to find the hot spots, areas of inflammation and other vital data in the report findings which could eventually lead to disease. Can thermographic screening really prevent cancer from occurring? What we do know is first, cancer is a complicated process and difficult to treat, and second, our bodies can and do respond to changes in our diet, lifestyle and overall self-care practices. If abnormal cells begin to proliferate, and we can see these changes in our thermography reports before an actual tumor forms, then we can be on the side of allowing our bodies every opportunity to heal and thrive. In our practice, you can be confident that your're in good hands. Our caring, capable and compassionate team is in your corner. Our role is to assist our clients in helping them to identify, halt and reverse possible development of disease through diet, nutrition, lifestyle changes, detox protocols and supplementation. We offer a complimentary preventative consultation during the time of imaging and are available to answer any questions our clients have regarding their report findings for no extra cost. We also offer comprehensive wellness plans for an additional cost for those clients who desire a more detailed plan to jump start their healing and health.